When’s the last time you prayed the Lord’s Prayer? I mean really prayed the Lord’s Prayer, like it meant something? If you’re like me, you might have answered that you pray it every Sunday at church, so of course, this prayer is familiar and known. But did you pause to consider if praying the Lord’s Prayer meant something to you? It means something because it’s the prayer Jesus gave us. It’s connected to our experience of worship. But does the Lord’s Prayer connect with your heart and soul in a way that deepens your prayers? Is the Lord’s Prayer more than a prayer you recite, but your lesson from Jesus on how to pray? Keep reading and we’ll unpack 10 ways Jesus teaches us to pray through the Lord’s Prayer. If you want to learn how to pray, look no further than Jesus’s teaching on prayer – the Lord’s Prayer. So, maybe you’ve been praying the Lord’s Prayer your whole life and still don’t feel like you know how to pray? Are you wondering how this is supposed to help? You need to go beyond merely reciting the prayer. There’s nothing wrong with reciting the Lord’s Prayer, but to truly pray it with impact and learn how to pray, you need to take it line by line and consider how each word is really an instruction on prayer. The disciples had watched Jesus pray numerous times. The more they watched, the more they began to wonder why his prayers weren’t like their own. The disciples were no strangers to prayer. They’d grown up in the synagogue and knew how to pray, yet something seemed different when Jesus prayed. Something seemed deeper, more sincere, more connected to God, more powerful, and more transformational, but they couldn’t quite put their finger on the difference. Jesus responded with the 72 words we know so well as the Lord’s Prayer. Yet, he didn’t intend this to simply be a memory verse, a prayer to only be recited from rote memory. Instead, he gave the disciples a template for prayer. In the Lord’s Prayer, Jesus outlined how to approach God in prayer, explaining the different conversation points we should have in our prayers, and how crucial it is to align our hearts with God’s. We memorize the Lord’s Prayer not just so we can recite a prayer, but so that we can easily recall the key components of prayer. The Lord’s Prayer may be committed to memory quickly, but it is slowly learnt by heart. Do you want to learn to pray? Have you been praying all your life, yet haven’t felt its power in your life? Are you just starting to experience prayer and wondering how it works? Or, have you been building your prayer habit, but keep seeing others who just seem better at prayer than you and want to know their secret? Come, sit at the feet of Jesus, alongside the disciples, and listen to his words. See the Lord’s Prayer through fresh eyes and learn how to pray from Jesus. This verse isn’t talking so much about where you pray, but your intentions when you pray. Prayer is your personal conversation with God, not an obligation or a performance. Don’t pray because you should or because you want to act the part of a ‘good Christian’, but because you seek a personal relationship with God. Your prayers can be long or short, free form or using scripture or written prayers, individual or repetitive. The requirement is only that we pray with sincerity. Don’t just say words to say words. Pray only the words your heart sincerely wants to share with God. Praise God in your prayers! We’re commanded to love the Lord our God with all our heart, mind, and soul. To do that well, we need to praise him for who He is. Praise God not for what he’s done or what you hope he’ll do, but simply who he is. When we pray for peace and wisdom and healing – what we’re really saying is Lord, we want a piece of heaven here on earth. We want more of you here – your kingdom here and now. Pray for a world at peace, a world with no more sickness or death, a world where everyone sings God’s praises all day, every day. If we’re to truly pick up our cross and follow Jesus, it means we have to submit to God’s plan for our lives. This one’s hard. It’s not asking God to bless your dreams, but to lay aside your own dreams and follow the dreams God wants to plant in your heart. Pray for God’s will in your life and to accept God’s answers to your prayers, even when his answers aren’t what you wanted. Jesus taught us not to worry, reminding us that God will provide and take care of our needs. Yet, it’s hard to trust in his provision. We feel like we need to do it all and take care of ourselves. Submit your heart and life to God, accepting his help and trusting in his provision. We’re human and we sin. That’s a fact of life. But, if you’re going to follow Jesus, you need to acknowledge your sins. More importantly, don’t just admit your sins, but turn and make a change in your life to try to live better. In your prayers, admit where you’ve fallen short and ask God’s help to make those changes and do better next time. Jesus was very clear on this one. Forgiveness is essential. You must find a way to forgive. This one’s hard and may take a lot of prayer. If you’re holding onto a hurt, spend some time in prayer asking God to help you forgive. There is evil in this world. Temptations lurk around every corner. Evil doesn’t always look bad. In fact, it often comes in very attractive packages, trying to lure us into missteps. Pray for a hedge of protection around you and your loved ones. Pray for God to keep you on the straight and narrow path. Pray for the strength to resist the temptations you face each day. Who’s on your prayer list? Who seems to be under the thumb of the evil one? Who are fighting disease, oppression, poverty, loneliness, relationship struggles, and all other forms of affliction? Pray for them to be delivered from all that holds them down. Stand in the gap and pray on their behalf for God to step in and fight back the enemy. The Lord’s Prayer is a prayer for all time. A single prayer that can transform your life. A simple prayer that can teach you all you need to know about prayer. A brief, 72-word prayer that can take a lifetime to fully pray. The study guide includes an introduction to each line of the Lord’s Prayer to bring greater focus to each week’s prayers, brief daily devotionals, additional scriptures, and key reflection questions to dig deeper. 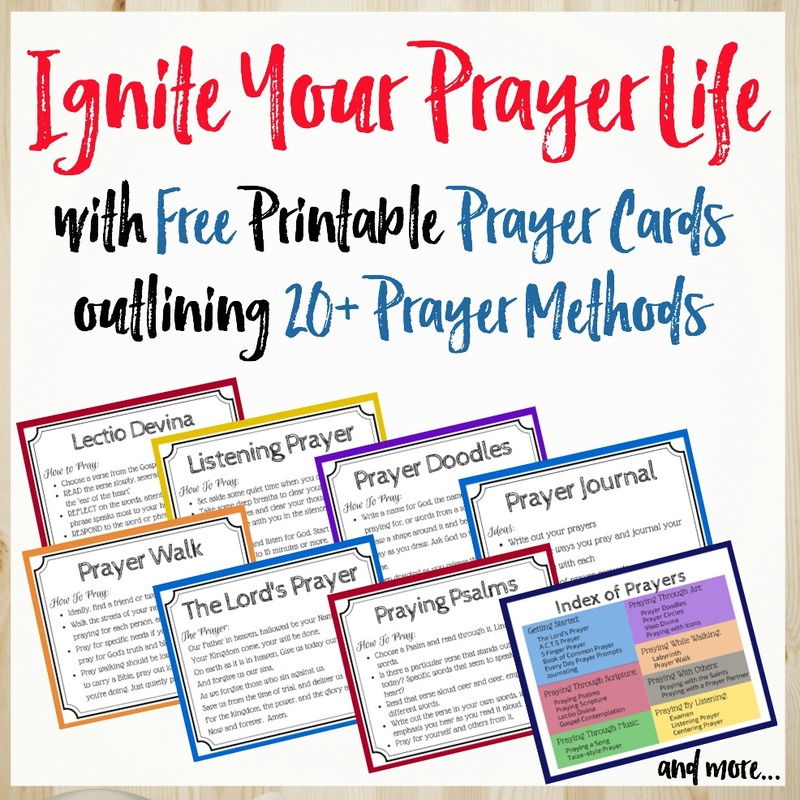 You’ll also get weekly recap worksheets to solidify what you’re learning about prayer and capture what God whispers into your heart as you pray. Available as a printable download or as a printed book. This is a great idea and I love the Frederick Denison Maurice quote!